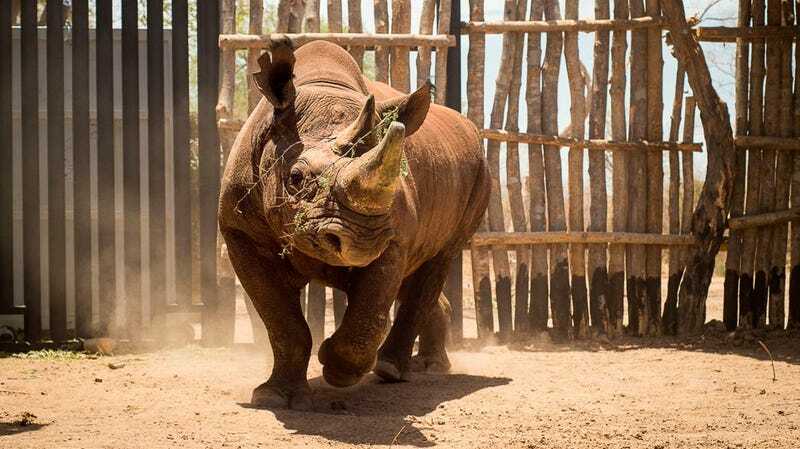 A critically endangered black rhinoceros being released into an enclosure in Zakouma National Park in Chad in 2018.
International auction house Sotheby’s has canceled an upcoming sale of rhino horn artifacts in Hong Kong and joined other companies like Bonhams in saying they will no longer list any goods containing rhino horn for sale regardless of its origin, Agence France-Presse reported on Saturday. “The company will no longer offer rhino horn artefacts in the future,” Nicolas Chow, chairman of Sotheby’s Asia confirmed in a statement. “Sotheby’s deplores any illegal slaughter and trading of endangered wildlife, and strongly supports conservation efforts from the global community,” he added. ... “In future, Bonhams will not offer artefacts made entirely or partly from rhinoceros horn in its salerooms,” Bonhams global CEO Matthew Girling said in a statement. Only five species of rhinos remain in the world today, and the IUCN Red List considers three of them (the black, Sumatran, and Javan rhinoceros) to be critically endangered. The white rhinoceros has made somewhat of a comeback but is still considered near threatened, while the Indian rhinoceros is considered vulnerable. All rhino species are considered at risk of further habitat destruction and poaching. Despite a 1977 ban on the international trade of rhino horn, criminal smuggling networks that feed mainly into markets in Vietnam and China remain a major threat to the future of the rhino. Some of the individuals who purchase it inaccurately believe that rhino horn has any number of medicinal benefits—it does not—though as Scientific American wrote, a major factor driving demand is that its expense and rarity has turned it into a luxury good and status symbol. The magazine noted that international media coverage focusing on the stereotype that it is used as an aphrodisiac may have been counterproductive, as it perpetuated a notion that was not previously widely held and distracted from the problem of the luxury goods market. Some research has shown that demand for rhino horn as a status symbol persists independently of how expensive it gets. The sale of antiques such as the ones being sold by the auction houses is permitted with a license from the Convention on International Trade in Endangered Species (CITES). In Hong Kong, the South China Morning Post wrote, any artifacts sold legally must come with “documentary proof, such as a certificate issued by the previous country of export” that they predate the CITES ban. Their antique status must also be verified by carbon dating, which is both pricey and time-consuming. However, the practice has been heavily criticized by conservation groups that say any trade in rhino horns helps contribute to the destruction of remaining rhino populations. According to AFP, auction house Christie’s had already banned the sale of rhino horn artifacts, while Bonhams made the decision to stop sales after an online petition campaign and pressure from 37 wildlife organizations. While the decisions by auction houses to stop selling rhino horn is a step in the right direction, CNN reported in October that the Chinese government had reversed a 1993 ban on the use of tiger and rhino products for medicinal purposes, angering wildlife groups. Earther has reached out to Sotheby’s for comment, and we’ll update this post if we hear back.